Banh Mi sandwiches exploded onto the scene couple of years ago and are here to stay. Many shops have sprouted up in and around NYC and other metro areas in the US and we’re still obsessing about them, a tell tale sign of a great sandwich. This wave hasn’t quite hit Jersey yet but it will. The Banh Mi is a popular Vietnamese sandwich made with pork, chicken, or beef along with pickled veggies, jalapeno slices and a spicy mayo. The sandwich is so simple and yet so friggin’ good you’ll want to make this at home over and over again. I, of course, had to make my own version of the sandwich which sort of happens with most recipes I make, especially when I’m seasoning meat. I just have to use Adobo! I use it in my chili, tacos, burgers, etc. It’s what happens when you’re growing up in the US and cultures and food traditions collide. Traditional dishes sometimes become some hybrid of American and _______ “fill the blank” cuisines! In our home that meant sofrito (Latino mirepoix) and tomato paste in our “Italian” spaghetti or pink potato salad which Mom always made using beets. Friends would come over and say what the hell is that, why is it pink?! I’d just say man, just eat it, it’s Dominican style! 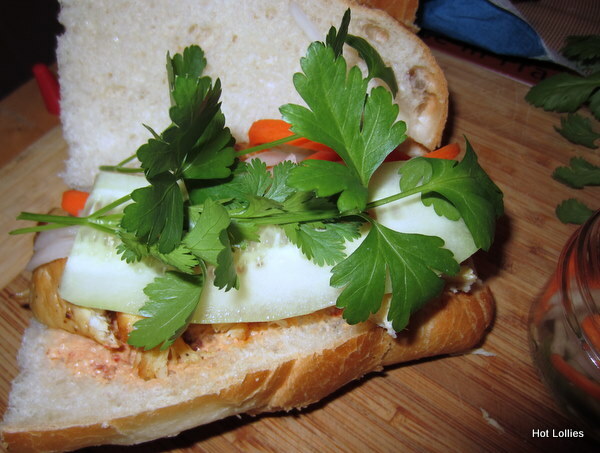 For this sandwich I pretty much stayed true to the Vietnamese style for the most part but I made a spicy mayo using chipotle and used Adobo to season the chicken. Talk about hybrid, ha! Seriously though, the flavors work really well. Adobo is just a spice blend of salt, garlic, pepper and turmeric and most banh mi sandwiches call for jalapenos for extra spice so the smoky chipotle mayo made sense. 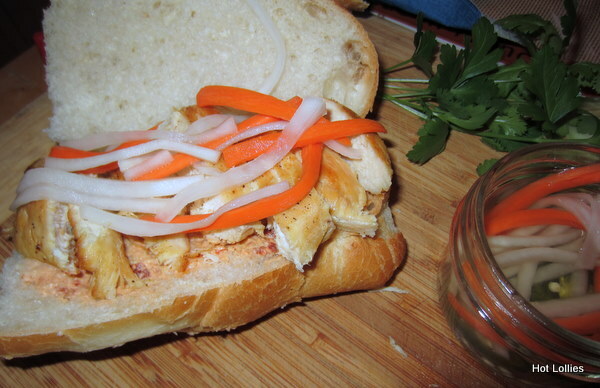 One of the keys ingredients to making a great Banh Mi is the bread. Actually the translation in Vietnamese just means bread, loaf or slice of bread which is probably why the filling varies so much. So first find a great bakery and get a freshly baked French baguette or Italian hoagie style bread. The Vietnamese French style baguette is what’s traditionally used but I used Italian hoagie style bread which works just fine. The important thing is that the bread is fresh, light, soft on the inside and chewy on the outside. Top with a thinly sliced cucumber, cilantro and extra spicy sauce and you’ll have a delicious, healthy, hearty meal. If you’re in the city or find yourself near a Vietnamese community please try one of these BUT if you can’t, make the one below and let me know what you think. Season chicken with Adobo and squeeze of lime. Let marinate for about 1/2 hour. Heat oil on medium heat, add chicken breast and saute until chicken is cooked through. Slice chicken breast on a biased cut. Spread a generous amount of spicy mayo on both sides of bread, add sliced chicken and top with pickled carrots and diakon. Top with slice of cucumber and cilantro. For extra spice, top with some sriracha and enjoy!! Add water, vinegar, salt, sugar in a small saucepan and bring to a boil. Remove from heat and let cool to room temperature. Add carrots, daikon and jalapeno to a small, clean glass jar and then fill jar with liquid. Let sit for several hours before using but best if overnight. These sandwiches are delicious! 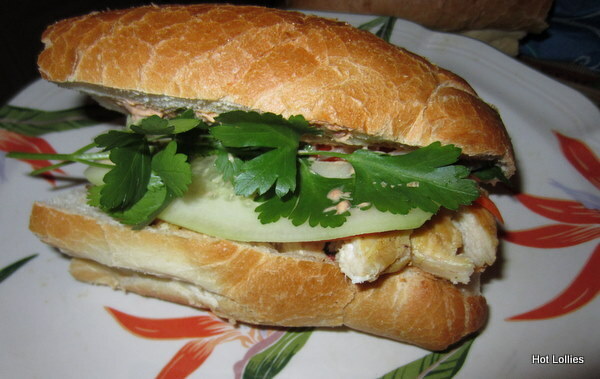 I had the chicken sandwich at a Vietnamese shop in NYC. I can’t wait to try your version! yes they are! Two of my favorite shops are Saigon in little Italy and Num Pang near union sq…definitely two to try and so inexpensive.